Is to cause an opponent or leave the defender in doubt, the feint stop is one of the most interesting and easy dribbles to do. In the previous versions, you have to press a button to activate, in PES 2016, you just stand still with the player to see ihe use the move. Traditional dribble present since the first versions of PES / Winning Eleven, the cut is without a doubt one of the most effective tricks to create clear chances to score. With it, the player will pretend a kick, and then pull the ball to the side, deceiving defenders and goalkeepers. How to do: press the shot button, and quickly press the pass button. You can select the direction of the dribble when holding the left stick to the desired side. 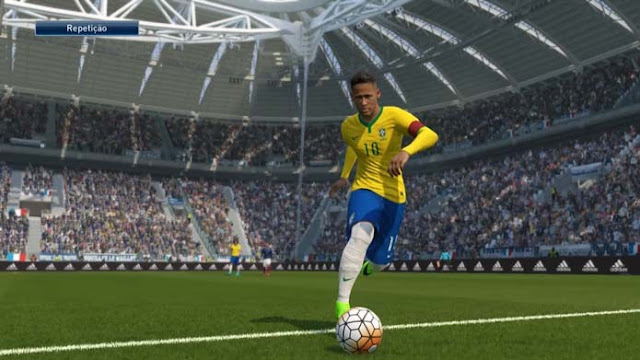 One of PES 2016 news, the kick in the vacuum is wildly popular in South America and in the game, the action goes something like cut, but it is executed with the standing player. How to do: with the player stopped, press the shot button and quickly press the pass button. Turning 360 is one of the nicest soccer dribbling – and it works especially well in PES 2016. With the trick, you can recover almost missed shots and still get rid of markers. How to do: Press the right analog stick forward (towards the chest of the player) and then hold the left stick forward. Remember that it depends on the athlete's position. Considered mere eye candy for many, the reel is a beautiful way to deceive defenders and find space defenses very closed. In the title, the movement is simple to perform, but it's complicated to follow the move. How to do: with stationary or walking athlete, double press the right analog stck quickly (R3 on the PS3 / PS4 and the RS on the Xbox 360 / One). Another novelty of the recent game, the freestyle football can really make life difficult for players trying to get the ball out of others. The dribble works incredibly well with skilled players like Neymar and Cristiano Ronaldo. How to do: To dominate the ball after a pass, hold the right analog stick (R3 on the PS3 / PS4 and the RS on Xbox 360 / One) and continue walking. Also you can do the dribble while walking with the player, simply hold the right stick. Fast and skillful players are often decisive in PES 2016, and the early race / sprint is another tool to let opponents back. With a feint, you can catch the defense off guard and approach the goal without much work. How to do: with the player stopped or moving, double press the sprint button quickly, and move the left stick in the direction you want to run.